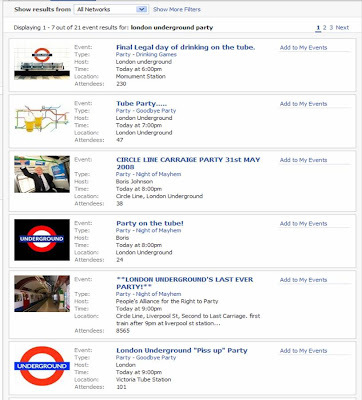 Facebook is being used to organise London Underground parties tonight. 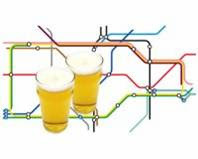 An alcohol ban will be introduced to the tube and other London Transport from midnight tonight (31st May) and a number of Facebook pages have organised parties on the Circle Line to take place before the alcohol ban is introduced. The biggest group is called ‘**LONDON UNDERGROUND'S LAST EVER PARTY! **’ with 10,356 attendees stating a desire to attend on the Facebook event page! “Kids and kidettes, it's official - we're getting on the first train to pass Liverpool street after the clock strikes 9PM , second to last carriage, travelling CLOCKWISE! huzzah and thrice huzzah! 9.02 at tower hill, 9.14 at embankment, 9.20 at Victoria and so on. May be wrong but I'm sure that's a damn good guess. More on this to follow. Spit spot. 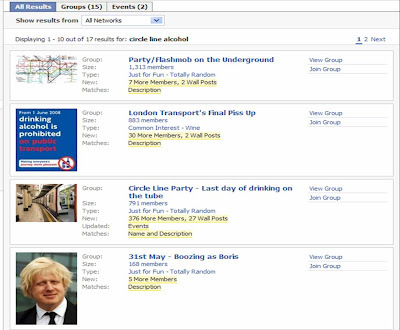 There are a number of other significant groups such as ‘Party / Flashmob the Underground’ with 1,313 members, ‘London Transport’s Final P*ss Up’ with 883 members and ‘Circle Line Party – Last day of drinking on the tube’ with 791 members. 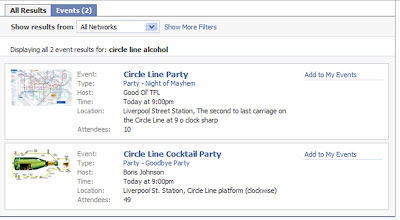 Interestingly Transport for London / Union Leaders / Police denouncing the plans for the Facebook Circle Line parties has led to widespread, mainstream media coverage which has in turn fuelled word of mouth – resulting in jumps in attendees / group members for the Facebook Circle Line parties. This is poses a difficult dilemma. Clearly the authorities can't just let these sort of events happen with no extra supervision, but reacting draws more attention, increases attendance and potentially creates a bigger problem than there would have been in the first place. 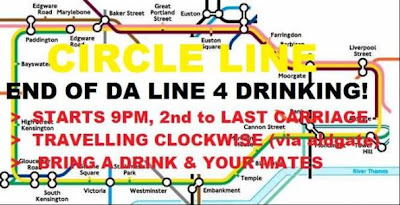 The Circle Line cocktail party is another demonstration of how effective social networks can be at distributing viral messages and mobilising users en masse. For advertisers and marketers the challenge is how to harness this to promote products, however things are more difficult when social network activity promotes mass gatherings / spontaneous events with the authorities having to work out how to respond most effectively. (http://gawker.com/tag/facebook/?i=394312&t=400-teens-destroy-87-million-home) and last night's tube problems are yet another example of the difficulty of dealing with the unpredictability of unofficial events promoted through social networks.